Sports hardwood is a professional flooring material preferred for the flooring of indoor sports halls. 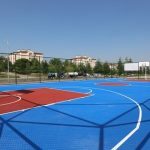 Having the options of natural wood laminate or solid wood parquet, the sports parquet floors, are flooring materials with multi-layer or single-layer varnishing for professional indoor sports halls. Any painting in desired color and shape, logo etc. can be applied on this floor. Sports parquet floors are applied at indoor sports halls and professional indoor basketball courts. The most suitable floor type for professional basketball, volleyball, and handball matches are wooden sports floors. What is the cost of Sports Parquet Flooring? The cost of sports flooring varies depending on many factors. 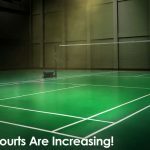 The dimensions of the court at the indoor sports hall is the first criterion in this issue. Then the prices are determined based on the properties of the wooden floor and the thickness to be chosen. Parquet floor can be either laminate or solid wood parquet. And also they can be single-layer or multi-layer. The use of rubber buffers at the lower layer is ideal to ensure flexibility.